I will demonstrate making a relief sculpture on December 5th. Please visit Melrose Arts art demos for details. This art form has been used since ancient times to portray images on walls and ceilings of caves, and as pictorial carvings on the side of mountains, as on Mount Rushmore. Relief sculptures are commonly seen on the surfaces of stone buildings such as the friezes on the Parthenon. It is often used to commemorate historic narratives, and on a personal scale as plaques, or on seals, coins, and jewelry. 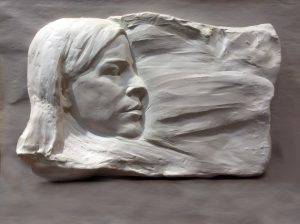 In this workshop this process will be demonstrated through reductive and additive processes to create a portrait relief sculpture.